After squandering their fortunes on food, drink and gambling, Tom Aimwell and Jack Archer, two London ‘beaux’ (gentlemen), seek refuge and rich wives in the country. The Beaux’ Stratagem finds them down to their last few pounds in the village of Lichfield in Staffordshire. Here, their stratagem for seducing ladies of stature and wealth – and returning as quickly as possible to London, of course – runs a-foul of true love and a colourful collection of rogues, thieves, dunces and strong women who give as good as they get. 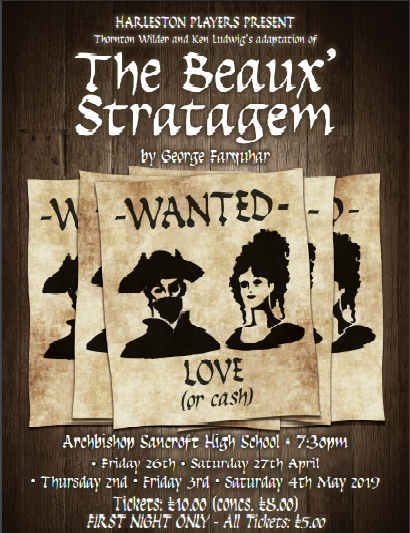 The Beaux’ Stratagem will be performed at Archbishop Sancroft High School on Friday 26th and Saturday 27th April and Thursday 2nd, Friday 3rd and Saturday 4th May 2019. Tickets, priced £10 (£8 conc.) on sale in April from Robinson’s Traditional Stationers, Harleston, 01379 855027 and online from this website.